JAXA has been operating the Advanced Land Observing Satellite "DAICHI" (ALOS) exceeding its design life of three years, and even after its target life of five years. However, at around 7:30 a.m. on April 22, we found that the satellite shifted its operation mode to the low load mode, and all the onboard observation devices were turned off due to power generation precipitation. The anomaly was detected through relayed data via the Data Relay Test Satellite "KODAMA." Since then, the power generation has been rapidly deteriorating, and we currently cannot confirm power generation. The DAICHI was launched on January 24, 2006. JAXA is investigating the cause of this phenomenon while taking necessary measures. 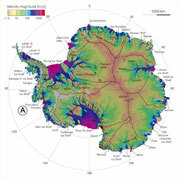 JAXA released the Glacial Lake Inventory of 10-meter accuracy on its website for the first time. The inventory was compiled using observation data of the Advanced Land Observing Satellite "DAICHI." JAXA has been conducting the research on glacial lake outburst floods in Bhutan Himalaya ("Bhutan GLOF project") supported by the Japan Science and Technology Agency (JST) and the Japan International Cooperation Agency (JICA) in corporation with the Department of Mineral and Geology (DGM) of the Royal Government of Bhutan and other domestic institutions to understand the status quo of the glacier. The result of the research is the Glacial Lake Inventory. As the inventory is the latest and highly accurate glacier information in Bhutan, including longitude and latitude, areas, length, width, and elevation, it is expected to be useful for evaluating the degree of hazard and measures against glacial lake outburst floods, which are serious problem there. 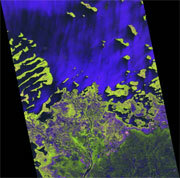 JAXA will verify the effectiveness of observations by the DAICHI’s synthetic aperture radar to measure tropical forestry in cooperation with INPE in order to contribute to the cooperative action plan agreed at the Ministerial Meeting of the Conference of the Parties to the Convention on Biological Diversity last month. The plan is designed mainly to provide more support to developing countries in parallel with the REDD+. JAXA and IPEN will compare JAXA’s high resolution image data acquired by the DAICHI synthetic aperture radar and INPE’s local observation data to verify the accuracy. 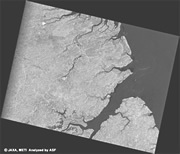 The Japan Aerospace Exploration Agency (JAXA) has generated the world’s first 10-meter resolution images and maps of the global forest and non-forest area distribution (in 2007 and 2009) using the Phased Array type L-band Synthetic Aperture Radar (PALSAR) aboard the Advanced Land Observing Satellite “DAICHI” (ALOS,) and will publish them on our website. We would also like to inform you that we will introduce the image maps at a side event for the 10th Conference of the Parties (COP 10) to the Convention on Biological Diversity and also at the Ministerial Summit for the Group on Earth Observation (GEO) to be held in Beijing in 2010. We will analyze and process past data to understand global-scale forest carbon volume change to compile useful data for control measures to tackle deforestation and forest deterioration, while continuing forestry observation by the PALSAR. For data distribution, we will conclude an agreement with cooperative organizations. The heaviest flooding has been occurring along the Indus River in north-west Pakistan since the end of July, and JAXA has been carrying out emergency observations on the disaster-stricken areas according to a request by Sentinel Asia and the International Charter on Space and Major Disasters. Various international activities will be deployed for recovery and restoration of the areas, and, recently, JAXA conducted observations to understand the current status of the Indus River basin and Pakistan overall, and provided the observation data to the Asia Development Bank (ADB) based on the Letter of Intention (LOI) between JAXA and ADB. 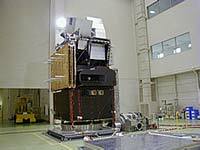 Observations of the broad flood-hit areas can be achieved thanks to the unique character of the JAXA satellite "DAICHI," which is equipped with the broad-area mode of the synthetic aperture radar. We were also able to sort out the flood-stricken areas by comparing the recent data and past observation data thanks to the DAICHI's achievements through four-and-half-years of global observations. In cooperation with the World Bank, the European Commission/Joint Research Center, and the United Nations (UNOSAT,) the ADB will support the Space Upper Atmosphere Research Commission (SUPARCO) of Pakistan to promote a survey project to recover and restore the areas using a remote sensing system and a geographic information system. JAXA carried out emergency observations on disaster stricken areas following major earthquakes in Haiti, on 12 January, and Chile, on 27 February, by using DAICHI. JAXA then provided essential data to concerning international organizations through the International Charter "Space and Major Disasters." On this account, Dr. Jose Achache, Director of the Group on Earth Observations, handed a special letter of appreciation to Dr Masanori Homma, Executive Director of JAXA. Based on the collaboration agreement between JAXA’s Advanced Land Observing Satellite “DAICHI” and NASA’s Tracking and Data Relay Satellite System concluded in June 2009, observation data acquired by DAICHI over the North and South America can be sent to NASA ground stations through the TDRSS, then transmitted to JAXA’s Earth Observation Center (EOC) via the Internet. Until now, JAXA’s EOC has been receiving DAICHI’s data through JAXA’s Data Relay Test Satellite “KODAMA” (DRTS). Now we can receive data more often through the TDRSS in addition to the KODAMA (the data volume is about a 20% increase, and twice as much if limiting to the data on the Americas.) DAICHI’s data through the TDRSS is also stated to be available to general users today. To start this operation, we signed a letter to the Secretary General of the intergovernmental Group on Earth Observations (GEO) on April 12, in order to report that this collaborative system will contribute to the establishment of the Global Earth Observation System of Systems (GEOSS) promoted by the GEO. 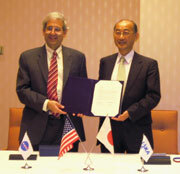 Cooperation with Mie, Kochi, and Tokushima prefectures for disaster preparation verification using satellites. JAXA and the Mie, Kochi, and Tokushima Prefectural Governments concluded an agreement to use JAXA's Advanced Land Observing Satellite "DAICHI" to jointly hold disaster preparation experiments to verify the effectiveness of satellites including DAICHI. Through this joint work, we are aiming to contribute to future disaster preparations by utilizing the large-volume communication technology. The DAICHI, launched on January 24, 2006, completed its three-year regular operation phase, and entered the post operation phase. The DAICHI has been utilized on many occasions such as mapping and observation of sea ice and forests in addition to emergency observations during disasters. The operation of the DAICHI will be continued for two more years as a post operation to make and expand satellite use by contributing to our daily lives as social and public infrastructure. We will also explore new fields for its use. JAXA and the United Nations Educational, Scientific, and Cultural Organization (UNESCO) concluded a Memorandum of Unity (MOU) for cooperating in monitoring World Heritage Sites using the "DAICHI" to watch and protect the common legacy of all mankind. JAXA and UNESCO held a ceremony for concluding the MOU at the JAXA Tokyo office on December 2, 2008, and President Tachikawa of JAXA and Director General Matsuura of UNESCO signed the pact. Vice Minister Sakata of the Ministry of Education, Culture, Sports Science and Technology of Japan (MEXT), Mr. Yamamoto, the Japanese ambassador to UNESCO and other MEXT and UNESCO personnel were also present. 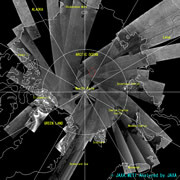 JAXA has been regularly observing the Arctic and Antarctic Circles as the two years between March 1, 2007, and March 1, 2009, are the International Polar Years. We are happy to announce that we have published on our website some of the images acquired by the Phased Array type L-band Synthetic Aperture Radar (PALSAR), one of the sensors onboard the DAICHI. 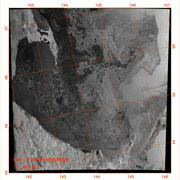 The PALSAR can carry out observations day and night on the earth's surface, including ice, and then process the acquired images automatically through its computer. We made a preliminary image with a resolution of 500 meters within a few days after acquiring data to compile a mosaic image by gathering pieces. One image covering a broader area of the Arctic and Antarctic Circles can be compiled in one recurrent period (46 days.) By comparing such images for a longer period, we can understand any changes in the ice and the land area covered around Arctic and Antarctic Circles. We have published some of the mosaic images taken in different time frames on the following page. We plan to update the images there. 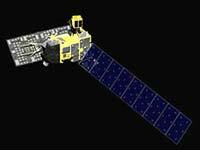 On May 13, 2008, JAXA carried out an emergency observation using our Advanced Land Observing Satellite, "DAICHI," on the disaster-stricken area in Sichuan Province in China, where a major earthquake struck on May 12, 2008, in order to contribute to the post-disaster rescue operations there. We received thank you letters from two Chinese disaster-related organizations, the China National Committee for Disaster Reduction (CNCDR) and the National Disaster Reduction of China (NDRCC), to whom we provided our data. Forest observation images taken by "DAICHI"
JAXA decided to publish images on the Internet that were acquired by the "DAICHI" as part of the on-going forest observation project. The image data that covers forests, swamps and deserts all over the world are processed into a 50-meter resolution map. They were acquired by the Phased Array type L-band Synthetic Aperture Radar (PALSAR) onboard the DAICHI. The maps were compiled in cooperation by JAXA, the European Union research institute, and other organizations that participate in the Kyoto and Carbon Initiative. The published images show the South-East Asian region, which falls under JAXA's jurisdiction. This is the first time images covering such a broad area were publicized. Images from other regions will also be released by their respective organizations as they are prepared. As a radar using L-band, the PALSAR is suitable for observing forests, thus it can easily identify areas of cut forests and flood areas that have been environmental issues in recent years. By continuously observing long-term and seasonal changes in forests, we can study the relationship with global environment changes. We biannually compile the broad-area images (mosaic images) by collecting data and connecting them. 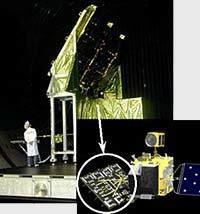 JAXA carried out a communication experiment with the University of Alaska on May 30, 2008, (Japan Standard Time) and successfully sent observation data from the "Daichi" to the NASA White Sands Test Facility via a US data relay satellite, the "Tracking and Data Relay Satellite F-10 (TDRS-F10.)" This is the world's first data transmission test of this kind. Data acquired by the Daichi is presently received at the JAXA Earth Observation Center in Hatoyama, Japan, via JAXA's data relay satellite "KODAMA." When Daichi acquires data outside of the KODAMA's coverage area, the data is recorded in the onboard data recorder of the Daichi and sent to the ground station when the Daichi enters the KODAMA's coverage area. Through the success of this experiment, the possibility that Daichi' s data can be received at the ground station in real time when it flies over the North and South American Continents, which are uncovered areas of the KODAMA, becomes much higher. For the TDRS-F10, it was the first communication experiment using the Ka-band antenna, one of its three onboard antennas. This is a brief report on the first experiment. We plan to do the second one in early June. After that, we will carry out detailed analysis of the results of both the first and second experiments for the final evaluation. April 17, 2008 -Up-to-the-minute-data and expertise derived from the Advanced Land Observation Satellite "Daichi "(ALOS) developed and operated by the Japan Aerospace Exploration Agency (JAXA) will contribute a better formulation of measures to adapt to climate change threats in Latin America and the Caribbean, according to an agreement signed today between JAXA and the World Bank. "Daichi " will be used by the World Bank as an effective tool to detect changes in vulnerable ecosystems region wide. "Daichi " capabilities will enhance the World Bank's adaptation initiatives in Latin America and the Caribbean. "Gaining access to this valuable data will help the World Bank in its efforts to support Latin American Countries better adapt to climate change," says Walter Vergara, World Bank Lead Chemical Engineer and Task Manager of a portfolio of adaptation projects in Latin America. " "Daichi " has three detectors that allow very high resolution of land cover, unsurpassed by other alternative means in coverage and accuracy. This will allow countries in the region to monitor the evolution of land cover and landforms, including the extent of tropical glaciers, the evolution of mountain and coastal wetlands and even the status of coral reefs, as an input for decision making in adaptation," Vergara added. "We hope that Daichi will make invaluable contributions to the Bank's projects in Latin American countries. This agreement will facilitate it through scientific and technical exchange including technical expertise and capacity building." explains Dr. Yasushi Horikawa, JAXA Executive Director. "This agreement represents a significant first step in our new partnership to tackle our common agenda of global environmental problems both on the ground and in space." Observation of High-Wave Damage on the East Coast of Toyama Prefecture by the "Daichi"
High waves along the coast of the east part of Toyama Prefecture on Feburary 24, 2008, destroyed the high-wave protection gate in Nyuzen-cho and houses in the surrounding area were also damaged. The photo is a composition (pan-sharpened) image made from data observed on February 22 (before) and February 25 (after) by the PRISM and AVNIR-2. The red circles indicate deciphermented places where the houses were destroyed. A huge earthquake occurred off Jyo-chuetsu, Niigata Prefecture (60 kilometers south-west of the city of Niigata), at about a depth of 17 kilometers at 10:13 a.m. on July 16, 2007 (JST.) The earthquake was named the "2007 Niigata-ken Chuetsu Offshore Earthquake." The Japan Aerospace Exploration Agency (JAXA) analyzed observation images acquired by the Advanced Land Observing Satellite "Daichi" (ALOS) on July 19 and confirmed the pattern of diastrophism. after heavy rains the previous day. According to the media, public transportation including bus services were hampered, and the water level rose to almost three meters in some areas. JAXA received an emergency request from the Sentinel Asia then swiftly observed Jakarta to help clarify the actual situation in the flood stricken area. On January 28 (Sun), JAXA and Tokai University exchanged Letters of Agreement to directly receive data from the Advanced Land Observing Satellite (ALOS) and to cooperate in research for data use and the development of earth observation systems. 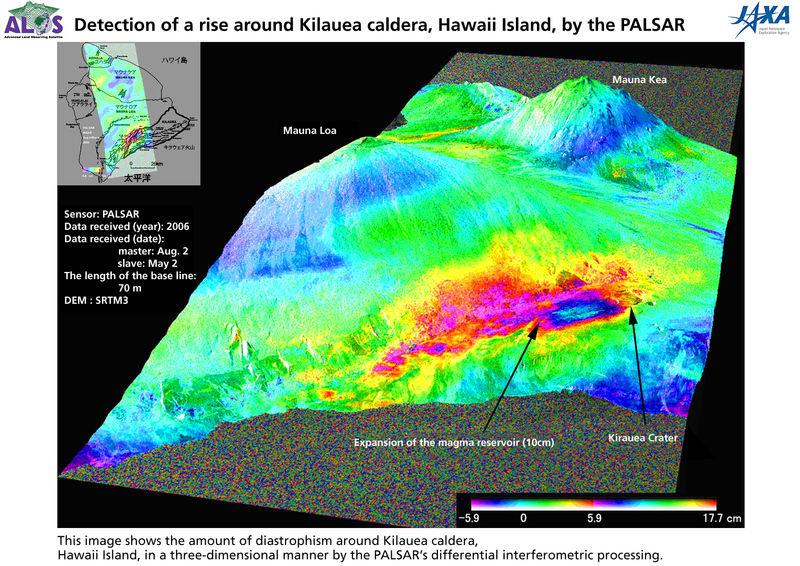 According to the "differential interferometric processing" (*) of observation images acquired by the PALSAR onboard the "Daichi" on the south part of Hawaii Island, Hawaii, USA, the five-meter diameter area around the south-west part of the Kilauea volcanic crater rose about 10 cm in three months between May 2 and Aug. 2, 2006, because of the expansion of a magma reservoir. In the image on the right, the amount of diastrophism is shown in colors. Warm colors show a decrease in the distance between the satellite and the land (rise of land), and cold colors indicate the increase of the distance (subsided land). 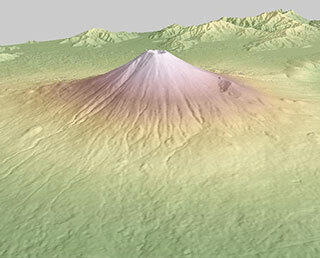 The caldera area rose by about 10 cm. GPS receivers are installed around Mount Kilauea, which is an active volcano, and information that supports the rising magma has been acquired over last few months. The observation data by the satellite explained the situation in a two-dimension manner. Differential interferometric processing is sensitive to the length of radio frequencies; therefore, it is reported that L-band, whose RF length is longer than that of conventionally used frequencies for SAR, is more suitable for interferometric processing. The observation again proved the excellent performance of the PALSAR, which uses an L-band 23.6 cm in length. This method will be used for detailed disaster analysis in the future. The Advanced Land Observing Satellite "Daichi (ALOS)" launched on January 24 this year (Japan Standard Time, JST) moved on to the operations phase on Oct. 24. Along with the start of the operations, observation data (called "ALOS data") from the "Daichi" will become available to domestic and overseas organizations. JAXA also started providing data to the Sentinel-Asia, which JAXA and other related organizations are currently establishing as a disaster preparation system in Asia. The Japan Aerospace Exploration Agency (JAXA) started the deployment of the Data Relay Satellite Communication Antenna (DRC) of the Daichi from 9:37 a.m., January 25(Japan Standard Time, JST), and confirmed that it had been successfully completed through telemetry data received at 9:44 a.m. January 25 (JST). The Japan Aerospace Exploration Agency (JAXA) confirmed that the sun tracking for the satellite solar array paddle (PDL) of the Daichi is normal through signals received from the Daichi at the Perth station in Australia. Its power generation is also normal. The station started receiving the signals at 12:31 p.m. (Japan Standard Time, JST) at the time of the revolution. The H-IIA Launch Vehicle No. 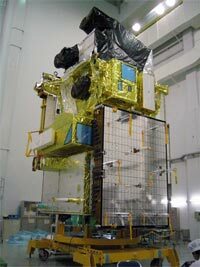 8 (H-IIA F8) with the Advanced Land Observing Satellite "Daichi"(ALOS) onboard was launched at 10:33 a.m. on January 24, 2006 (Japan Standard Time, JST.) The initial flight angle (azimuth) was 115 degrees. In early November, we performed the third tracking and control rehearsal for the ALOS at the Tsukuba Space Center. Four days of critical phases between the launch phase to the deployment of the solar array paddles and the PALSAR antenna were simulated. Operators also trained for early satellite operations by sending commands and receiving telemetry signals for 24 hours a day. 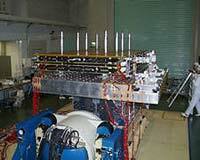 The replacement of the transistors for the reaction wheels, in which an anomaly was found with a different satellite, was completed for the ALOS, and the electric test for the satellite was carried out at the Tanegashima Space Center. A part of the image data of the PRISM, one of the onboard observation sensors, showed an abnormality during the test, but we quickly found countermeasures, and, the image data processor is now being tuned up at the manufacturer's plant. 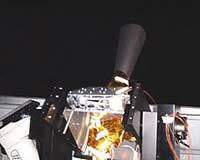 As soon as the tuning is completed, the final system verification will be performed so it's ready for launch within Japan Fiscal Year 2005. Tests on the Advanced Land Observing Satellite (ALOS)at the Tsukuba Space Center were recently completed and the satellite was delivered to the Tanegashima Space Center (TNSC) in mid May. The final assembly and mass measurement have already been carried out at the TNSC, and an electric performance test is currently underway. 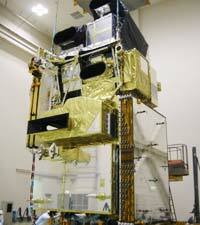 This test is the final performance and function verification for the satellite on the ground. After completing the test, the ALOS will be loaded with propellant and encapsulated by the fairing. Following the thermal vacuum test that took a month, the ALOS is now undergoing its final electric performance test. This test is to make sure that the electric performance and function of each piece of satellite equipment that were verified by the initial electric performance test have not deteriorated after the various environmental tests, namely vibration, acoustic, shock, and thermal vacuum tests. The ALOS will be visually inspected for the last time after this final electric performance test, and the ALOS team will prepare to transport the satellite to the Tanegashima Space Center. The ALOS team has almost completed inspections, modifications, and additional verifications for ensuring a succesful mission, and is now carrying out a thermal vacuum test. The ALOS is scheduled to be launched sometime in the next fiscal year. The photo shows the satellite in a 13-meter diameter vacuum chamber just before the door was closed. The thermal vacuum test is to verify the electrical performance and thermal design of the satellite under a simulated space environment. 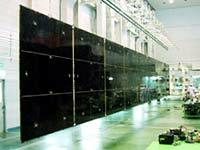 The test will be followed by a final electric performance test and shipping preparations to Tanegashima Space Center. After the successive failures of our projects last year, JAXA is re-examining satellites, and ALOS is not an exception. 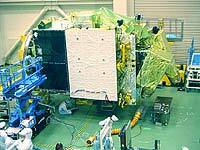 ALOS, which is scheduled to be launched in the next Japanese fiscal year, is currently undergoing a system checkup. In the process of the checkup, a huge volume of data on design manufacturing, and tests that are stored at JAXA and manufacturers are being reviewed. 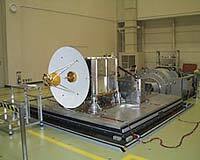 Also under inspection are satellites that are under various mechanical environment tests or electrical tests. Many project personnel and JAXA experts are involved in these checkups in order to ensure successful missions by incorporating any abnormalities found during the checkups. ALOS is now under a system proto-flight test starting with an initial functional verification and mass property test. The ALOS system proto-flight test (System PFT) started in the Spacecraft Integration and Test Building (SITE) at the Tsukuba Space Center (TKSC) as the proto-flight model (PFM) has mostly been integrated. We have already finished an initial electrical performance test and a system mass property test. We verified the mass and its balance of the spacecraft's main body through the mass property test, and are currently preparing for a system vibration test which will be conducted in the end of December. Photo: ALOS will be controlled to face its sensor apertures (a black part) to the earth. compatibility test with ground equipment of the Earth Observation Center (EOC) was a rehearsal for processing data sent from the ALOS on the ground. The ground station equipment was brought into the Spacecraft Integration Test Building at the Tsukuba Space Center from the EOC in Saitama prefecture to connect the equipment with the ALOS for data acquisition. Mission data acquired from the three onboard sensors (PRISM, AVNIR-2, and PALAR) and other data for attitude control are being analyzed and evaluated at the EOC. Now the ALOS is moving to the next phase of the system proto-flight test (System PFT), and the first test in this phase is an Initial Electrical Performance Test (I-EPT.) The I-EPT is an important test because its test data will be compared with electrical performance data obtained after each environmental test, such as a thermal vacuum test, vibration test, and pyro-shock test, which will be carried out later, to evaluate an impact of each environmental test. The assembly and integration tests of the ALOS Proto-Flight Model (PFM) are currently in progress at the Spacecraft Integration and Test Building (SITE) in the Tsukuba Space Center (TKSC). We have already assembled the major subsystems (including the solar array paddle, data relay communication antenna, and Panchromatic Remote-sensing Instrument for Stereo Mapping (PRISM)) with the satellite's main body, and are now conducting a series of electrical tests. We are going to install the Phased Array Type L-band Synthetic Aperture Radar (PALSAR) into the satellite this April, and that will complete the assembly process. When all the electrical and mechanical integration operations are completed this summer, the PFM of ALOS will be fully ready for the proto-flight test. The integration and testing of the ALOS Proto-Flight Model (PFM) is currently in progress at the TSUKUBA Space Center. We commenced the integration and testing operation from the lower module (BUS Module), following its transportation to the Tsukuba S.C. 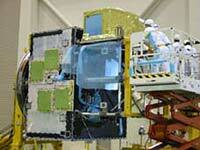 Presently, AVNIR-2 and the Mission Data Handling equipments are assembled to the middle module (MISSION Module). The photograph shows the AVNIR-2 integration. In the "World Summit on Sustainable Development" held in Johannesburg, South Africa, NASDA makes presentations on satellite-based earth observation and the utilization of observed data as a part of Japanese contributions. ALOS contributes various roles to the global environment via disaster monitoring and global mapping. The "Global Mapping" project is proposed by the Ministry of Land, Infrastructure and Transport (MLIT), aiming to develop digital geographic data sets. ALOS will give us many advises to save our planet. 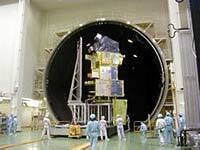 The ALOS Proto-Flight Model (PFM) was delivered to the TSUKUBA Space Center. 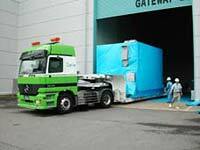 The pre-integration operations had been carried out at the manufacturer's sites before this transportation. From now on, ALOS will be integrated and testd for about two years at the Satellite Integration and Test Building in the TSUKUBA Space Center until its shipping to the launch site. Visitors can see the ALOS's assembly in the in the Open House Day in spring and autumn. The deployment test of the ALOS's Solar Array Paddle (PDL) for its Proto-Flight Model (PFM) was conducted at the NTSpace Komukai Works. The ALOS's PDL is the largest solar array paddle ever developed in Japan. It generates 7kW at the end of life (EOL) and has 3m width and 22m length. The deployment of the solar array paddle is the most important and critical sequence in satellite's post-launch phase. The successful deployment is vital to the satellite life and the whole mission. Therefore, we must conduct PDL's ground deployment test repeatedly to confirm its function. At the ALOS project, the paddle deployment test is going to be conducted six times before and after the mechanical environment test. A deployment test using the Proto-Flight Model (PFM) of the data relay antenna was conducted at the Tsukuba Space Center. To transmit data via DRTS on geostationary orbit, DRC's parabola has to be pointed DRTS correctly. DRC compartment is installed on the top of boom and it can rotate to any direction. 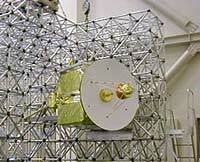 In the launch phase, DRC antenna is stowed and tied to ALOS's main body. After a day of launch, ALOS will fire the separation nuts to free DRC's compartment. The elbow of the boom will be straightened to set it ready for the operation. An acoustic test using the Proto-Flight Model (PFM) of the Panchromatic Remote Sensing Instrument for Stereo Mapping (PRISM) was conducted at the Tsukuba Space Center. PRISM observes three directions (Forward, Nadir, Backward) by three telescopes to collect land surface data for 3 dimensional mapping. This photo shows the telescope for Forward and it observes land surface through the aperture. 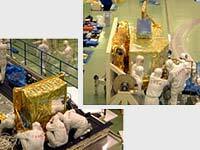 To avoid distortion of observed images induced by thermal deformation of PRISM's structure, the whole body of the telescope is covered with multi-layer insulators as thermal blanket (gold color). After the system integration, PRISM will be covered with additional insulators (black color) to maintain its temperatures against orbital thermal environment. A field test using the Engineering Models (EM) of the Star Tracker (STT) and the On-board Attitude Control Computer (AOCE) was conducted at the Institute of Space and Astronautical Science (ISAS) Usuda Deep Space Center (UDSC). This field test is an important step for the Attitude and Orbit Control Subsystem (AOCS) to confirm its performance of star identification and attitude determination with real-sky stars. Usuda is far away from towns and has good starry sky with good weather and without atmospheric disturbance. In addition, this field test was held in the term of a new moon. The developments of ALOS PFM (Proto-Flight Model) components are being completed one after another. The Paddle Drive Mechanism (PDM:Upper Left), assembled at the root of a solar array paddle, rotates the paddle to face the Sun for maximizing the power generated by solar cells. The Direct Transmission subsystem (DT:Lower Right) transmits observed data directly to ground stations. The white component is the X-band antenna to be installed on the outer panel of the satellite, and other components will be installed inside. 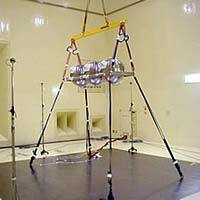 At the Tsukuba Space Center, a sound test on the fuel tanks for the Proto-Flight Model (PFM) was conducted. After the separation of the tanks from the rocket, the position of the satellite will be controlled by the thruster (gas jet). These tanks will store hydrazine as the satellite's fuel and can contain more than 180 liters for 3 tanks. After the completion of the series of tests, the installation of these tanks is expected onto the main structure of the satellite along with the thruster, valves and pipes. 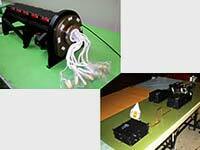 The Proto-Flight Model (PFM) electric source bus devices were completed and delivered to NASDA. These provide electricity generated in the solar array paddle to each piece of equipment in the satellite and enable it to use electricity accumulated in the battery when the satellite is in the shadows of the Earth. The black device will be assembled inside the satellite and control the battery charging/discharging and the power circuit. The silver device exchanges the remaining electricity into heat and releases it into space. This device is installed onto the external surface of the satellite for effective heat release and finished with effective heat radiation surface material. At the Tsukuba Space Center, a Thermal Vacuum Test was conducted for the ALOS's radio sensor PALSAR (Phased Array type Synthetic Aperture Radar) Proto-Flight Model (PFM). PALSAR that emits a radio wave and receives the scattering on the ground surface as a radar sensor, is a all-weather type sensor which monitors an area covered even with clouds and during the nighttime. PALSAR is expected to have significant contributions to the disaster observation and natural resource survey. 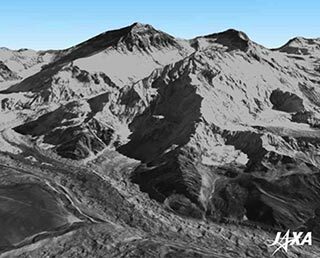 With the high resolution data acquired at ALOS, the three of STT, distinctive on the surface, is used to measure exactly the longitude and the latitude for a map drawn on a scale of 1:25,000. Collating a sidereal catalogue installed on ALOS with the sidereal observed on STT, it enables to determine the satellite's attitude with 0.00002 degrees of high precision. At the Tsukuba Space Center, a Thermal Vacuum Test for the AVNIR-2 Proto Flight Model(PFM), which is an optical sensor, was conducted. 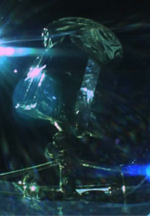 AVNIR-2 in the Vacuum Chamber observed a light in a regular pattern that is emitted from the test equipment outside the chamber, and verified the designed performance for space environment. Photo shows the preparation for testing, and AVNIR-2 is composed of Scanning Radiometer Unit (Upper Right) and Electrical Unit (Lower Left). ALOS Project verified to start manufacturing and maintenance design phase through the Critical Design Review (CDR). Currently, onboard devices are manufacturing and some completed conponents are sequentially assembled to the main structure of ALOS (the reference in Topics May 2001). This diagram is the prospects of ALOS on orbit, based on the current design. The above photograph is the main structure of The ALOS Proto-flight Model (PFM) in manufacturing. As the ALOS's structure, this truss is going to be assembled with panels, to which various components and observation sensors will be attached. After completing the assembly, we will conduct a variety of tests toward the launch of JFY 2003. We conducted a series of radio performance tests for the PALSAR engineering model (EM) of ALOS at the Tsukuba Space Center. The photo shows single panel being tested, but in orbit, four panels folded will be deployed to the approximate size of 3m x 9m. This test verified PALSAR's performance as a radar, and now we start the manufacturing of a PFM (proto-flight model), which will actually fly in orbit. 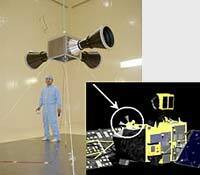 This picture shows the Thermal Test Model (TTM) of ALOS. We have introduced the Mechanical Test Model (MTM) in the previous topics. Can you tell the difference between TTM and MTM? Those parts in golden, silver, and black parts are thermal control material called MLI and OSR. Their function is to insulate heat or radiate heat so that the satellite will function normally in the thermal environment on orbit. In other words, a space suit for the satellite. 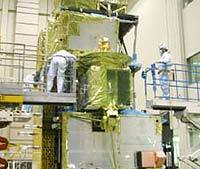 The photo shows the preparation of thermal testing in a 13 meter Thermal Vacuum Chamber at Tsukuba Space Center. After setting up the satellite within the chamber, we realize a vacuum condition in the chamber to simulate space environment. Simulating solar light by xenon lamps and earth's infrared radiation by IR panels, we conduct the test to validate the thermal design of the satellite. 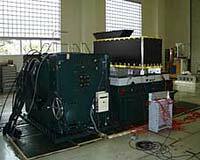 This photograph shows an overview of ALOS system MTM (mechanical test model) in a vibration test. (Front side in the photo is the earth direction.) The test was successfully completed and we confirmed that ALOS would withstand H-IIA's launch environment. With this test, mechanical test by MTM was completed and we will proceed to the verification of thermal design using TTM (thermal test model). 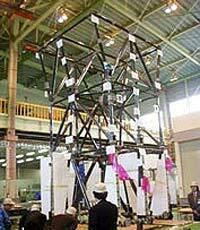 The picture is ALOS system MTM (mechanical test model). 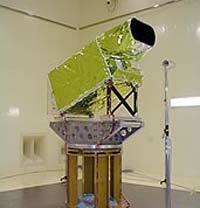 ALOS is a Large satellite with 6.5m in height, 4m in width, and 4ton in weight. The satellite's flight direction is up in this picture and earth direction is to the right. 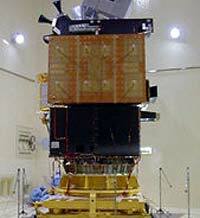 Satellite's upper part is PRISM (the inclined box is one of PRISM's radiometers), the blown panel shown in the front is PALSAR, and the equipment attached to the side of the earth direction is AVNIR-2. This photograph shows MTM in an acoustic test. We finished the acoustic test without any problem and are planning to have a vibration test next. At Tsukuba Space Center, we conducted a vibration test on the MTM (mechanical test model) antenna panel of PALSAR, which is a radio sensor to be embarked on ALOS. 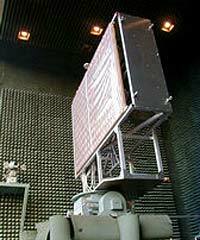 The PALSAR antenna consists of four panels and will be deployed (approx. 3m × 9m) on orbit. However, in order to evaluate its endurance against the vibration environment in ALOS launching, we tested PALSAR MTM in the folded configuration as the photo shows above. The test result verified the endurance of the PALSAR antenna. We conducted the vibration test on the mechanical test model of data relay antenna by large scale vibration test device in Spacecraft Integration and Test Facilities (SITE) at Tsukuba Space Center. The durability of this antenna in the state of vibration which occurs at launching of ALOS was confirmed from the result of the test. The Vibration Test of AVNIR-2, one of the onboard sensors of ALOS, has been conducted using mechanical test model at Tsukuba Space Center. The test aims to confirm that AVNIR-2 is capable to sustain the vibration environment in lift-off and in-flight phase. We are now conducting the Preliminary Design Review (PDR) at each onboard instrument. PRISM, one of the remote-sensing instruments of ALOS, is a panchromatic radiometer with 2.5-meter spatial resolution. We finished testing of Bread Board Model (BBM), and are now producing its Engineering Model (EM).